The weather around here was starting to feel decidedly fall-like over the weekend when suddenly it's 85 degrees and dripping humidity outside again today. I love fall and would happily dig out the pullovers and cardigans in August if I could. But oh well. Mondays are wash day, so we cranked up the AC again and dragged the giant laundry hamper down to the laundry room. We city-dwellers do a lot of carrying--or "schlepping" as everyone in NYC calls it. Every day I find myself carrying something: usually the kid and her toys when she gets tired on the way home from the playground, the groceries from the supermarket, diapers and shampoo from the drugstore, fruits and vegetables on our daily jaunts to the greengrocer. The list never ends. The other day we dragged a humidifier all the way across town. Thank goodness we can hang bags from the handles of the stroller, but I've certainly built some powerful biceps over the years. At one time, the Union Square Green Market sold those terrific string market bags you see every once in a while. I always meant to get myself one or two. 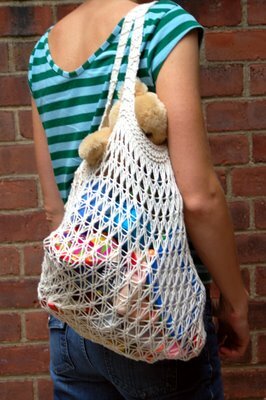 They fit in the bottom of a handbag (or diaper bag) and can be used as a more environmental option to the ubiquitous plastic shopping bag. But I haven't been able to find them anywhere, despite looking at all the natural food stores in the area. No matter. When I ran out of projects during our vacation, I nabbed Todd's computer and grabbed the pattern for the Saturday Market Bag off MagKnits. It was perfect: small, fast, and used cheap yarn that was available at the nearby megamart (no knitting shops to be found for miles!). And it was fun to knit lace with giant size 15 needles. I changed the pattern to make the bag a bit narrower, and I knit the front and back as one piece (no bottom seam). I also made two separate shorter straps instead of one long strap. And I love it! We use it almost every day, and it expands to fit more than I imagined it could hold. First of all, I cast on and knit only 35 stitches instead of the 45 stitches the pattern suggests. I knit the repeat approximately 14 times, then cast off and folded the knitting in half to form the bag shape. Sew the side seams together and the bag itself is done. By the way, I recommend using bamboo or wooden needles when knitting the bag, since aluminum needles are really slippery. It can be very easy to drop lose a stitch when your needles are so slick. The pattern for the lace is quite simple but feels a little awkward to knit. Be patient with yourself! 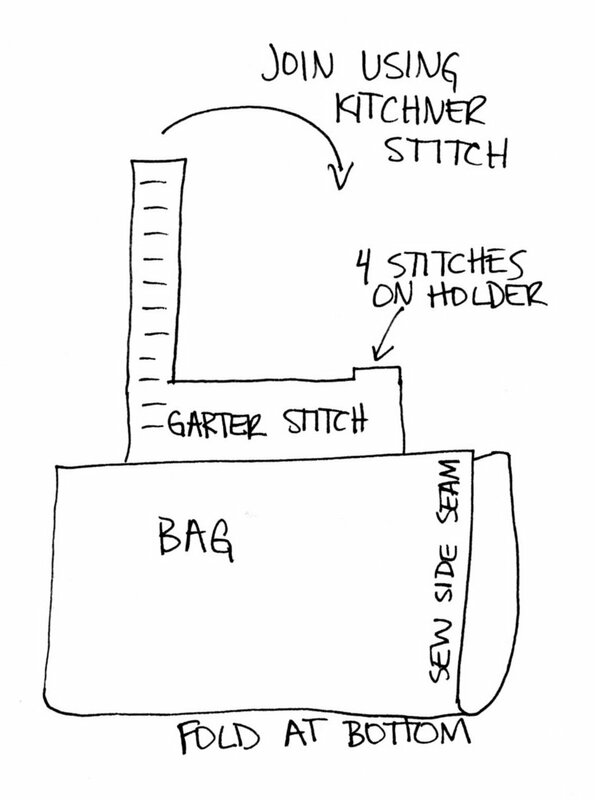 Instead of using a circular needle and picking up stitches all the way around the bag, I worked each side separately. I picked up approximately 26 stitches in the center of one side of the bag, leaving a couple of inches free on either side. I knit those 26 stitches in garter stitch for 4 rows, then put the first 4 stitches on a stitch holder, cast off 18 stitches, and continued to knit the last 4 stitches in garter stitch for approximately 48 rows. Remember, the straps will stretch a lot when you start using the bag, so make them shorter than you think they'll need to be. 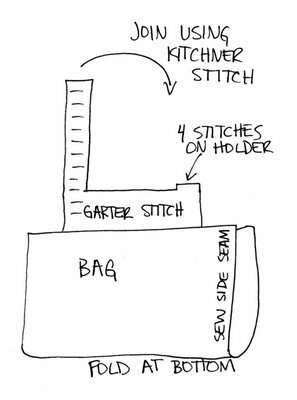 Join the strap to the 4 stitches on the stitch holder using Kitchner stitch (Joelle's book gives great instructions for this). And do the same thing on the other side of the bag. Here's a little illustration to give you a better idea what I did. It's not pretty, but I think it gets the point across. I hope that makes sense, but please let me know if you want me to clarify any of the instructions. Liesl - I love it! And I think your pattern variation is a real improvement on the original, especially the straps. IS there any way I could bribe you to provide some more details on how you made the alterations? I've never knitted lace but I'd be happy to tackle this if I had a detailed pattern for how to make it just like yours. What a great bag! I don't knit, but if I did, I would make one! Love your striped shirt! The bag looks great - classic and useful. Think I would like to give it a go but like Sooz need some details on the alterations you made. Is there any way between us we could bribe or curry favour with you? Cool! Can you post the adjustments you made for the handles? ;-) Am I asking too much?! This is really cute, I really really like it! Beautiful bag! I'm still a beginning knitter, so I'd probably be at a loss as to how to modify it (which is too bad because your modifications are perfect! ), but I'll try making the original version. THANKS! Your bag looks really great! I think I'm going to have to knit it now. i love your variation. i made the bag this summer pretty much as written and with aluminum needles (what a nightmare!) because it's what i had at home. I've been looking for such a bag for using with Euroflax Linen - It's a Christmas present for my mom - and I think your design is great! Great pattern mods. What yarn did you use, and do you remember how much yarn it took? Hmmm, it was so long ago! I think I used Peaches and Cream, and it took less than 2 skeins. Also, I'm still using it on a regular basis and it's holding up really well! Might have to make another one this summer, we use it so much. This is awesome! Several people on Ravelry have linked to these mods, and I hadn't seen these yet. I'll definitely have to make a post on my blog. I made this in black and loved it. This is a great design I am really looking forward to trying it.